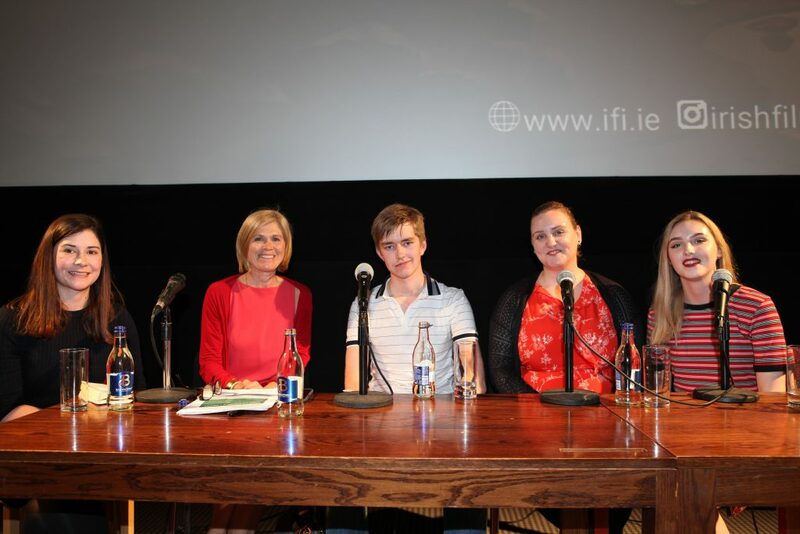 The Irish Film Institute was the venue last Saturday for a very special screening of The Breadwinner , the Oscar nominated animated film from Irish Director Nora Twomey and Executive Producer Angelina Jolie. The film, set in 2001, follows a remarkably brave and determined Afghani girl named Parvana, as she struggles to help her family under the dangerous and claustrophobic gaze of the Taliban. This intelligent and thoughtful film asks the viewer to contemplate the kind of limitations and obstacles that are placed in front of girls and young women, not just under a harsh regime like the Taliban’s but in wider society too. As we consider the impact of huge injustices like early marriage and gender based violence right across the developing world, The Breadwinner acts as an important vehicle for provoking debate and discussion about human rights, particularity among young people. As a child-focused organisation, ChildFund was delighted to represent the important work of NGO’s in a post-screening Q&A session, where some of its big themes were explored. Our ambassador Anne Cassin spoke about some of the wide-ranging work ChildFund undertakes, to support girls in difficult situations and to empower their progress. Amongst other topics, Anne spoke about her 2016 visit to Ethiopia, to witness the first batch of girls to receive bicycles, as part of our Dream Bike campaign, to offer girls better access to education. Right across the developing world ChildFund supports numerous initiatives to fight gender inequality and support girls advancement, including the scourge of early marriage in India. The interesting Q&A session was facilitated by Sarah Ahern, Programme and Project Manager for Dublin Film Festival, currently tasked with expanding knowledge of The Breadwinner as a fantastic vehicle for engaging young people in thinking about human rights, and global development. Lorraine Lordon from the award winning studio Cartoon Saloon, the animators behind the films stunning visuals, spoke about how the films creative process came to pass and the deep thought that went into it . Ryan O’Neill and Jenifer Kilmurray eloquently represented the voices of youth, in their engagement with the big themes of the film. Ryan, as a budding animator, and Jennifer, representing the Children’s Ombudsman’s programme, celebrating the 25th anniversary of Ireland’s ratification of the United Nations Convention on the Rights of the Child (UNCRC). The central message was clear, if we want to promote a more just world its vitally important that the voices of children and youth, are heard. Its also vitally important that we work to empower girls and young women, who remain hugely disadvantaged. That’s something we at ChildFund hear loud and clear, and one of the reasons why we fight gender inequality and support children’s participation in the implementation process for the Sustainable Development Goals. Among the interested guests at the Q&A was Ireland’s former Ambassador to the United Nations, David Donoghue, who will always be remembered for his key role in co-chairing the complex negotiations which led to the historic Sustainable Development Goals agreement. Also in attendance at the event was the French Ambassador to France, H.E. Stéphane Crouzat. ChildFund is dedicated to creating safe, nurturing environments where children can be better protected and supported, and where their human rights are fully recognised. We want to see a world in which children are free from violence and exploitation, as we look to realise the vision, ambition and opportunity presented by the Sustainable Development Goals (16.2). ChildFund would like to express its sincere gratitude to Element Pictures Distribution for hosting this very special screening, and indeed for providing a platform for such an important and timely discussion on children’s rights to take place.